The Mekong River, the 12th-longest river in the world at 2,700 miles (4,345 kilometers), is the main artery of Southeast Asia. Its flowing waters are the beating pulse for a region that includes the fertile Mekong Delta around Vietnam's Ho Chi Minh City, the scenic hills of Laos, and the jungle-lined waterways of Thailand and Cambodia. River tours in small traditional boats offer visitors a chance to experience the culture and communities that thrive along the Mekong’s waters. Opt for a day tour from Ho Chi Minh City and cruise around the floating markets of the Mekong Delta; discover the islands along the Mekong and Tonle Sap rivers on a half-day tour from Phnom Penh; or cruise across the border from Thailand to Laos. Boat tours operating on the river include small wooden motor boats, traditional sampans, and speedboats, while rafting and tubing are also possible in some sections. Most boats provide little shade, so be sure to bring a hat, sun protection, and mosquito repellent. Some boat cruises may be wheelchair accessible, but it’s best to check in advance. The Mekong River is accessible from several major cities, including Ho Chi Minh City in Vietnam, Vientiane in Laos, Chiang Mai in Thailand, and Phnom Penh in Cambodia. While public transport runs to some of the larger towns along the Mekong, the easiest way to travel is as part of a guided tour. Mekong cruises run all year-round, but the most popular time to visit is between September and March, when the high water levels mean more choice for boat trips, floating markets, and floating villages. The wet season runs from May until August, but it’s still possible to visit during this time and the weather is still warm—just pack a rain poncho as the open-air boats offer no protection from showers. A Mekong River cruise offers a fascinating glimpse into rural life, gliding past lush rice paddies and fruit orchards, watching fishermen cast handmade nets in search of the day’s catch, and sampling tropical fruits and coconut candies at the floating markets. The river is also home to some of the largest freshwater fish in the world, and lucky travelers may even spot one of the rare Irrawaddy dolphins that live in the Mekong’s waters. The Cu Chi Tunnels are an integral part of Vietnam’s history, making them a must-see attraction. Opt for a luxurious experience of the tunnels on a tour that includes round-trip transport by luxury limousine and a cruise on the Mekong River. In an intimate group limited to seven, you’ll travel in air-conditioned comfort, explore the tunnels with a guide, and explore the Mekong Delta on a rowboat, which causes minimal disturbance to the local wildlife. See the beauty and hidden wonders of Laos on this Pak Ou Caves and Kuang Si Falls day tour. Follow your friendly local guide through the streets of Luang Prabang, then make your way along the Mekong River to the Buddha-filled caves of Pak Ou. You'll visit a rural village where locals make rice wine and see how indigenous people live. Next, head to the stunning waterfalls of Kuang Si and savor a picnic lunch in one of the country's most picturesque destinations. Visit a floating market, cruise the Mekong River, and row shady canals on a 2-day tour from Ho Chi Minh City that explores the best of the Mekong Delta. With a local guide to lead the way, you’ll learn about Mekong Delta agriculture, food, and traditional music, joining the bustling crowd of vendors at the Cai Rang floating market. This 2-day Mekong Delta tour includes pickup and drop-off at hotels in Ho Chi Minh City, as well as an overnight in a comfortable, 3-star hotel. Enjoy the best of Thailand’s culture, traditions and destinations with this private tour of Hill Tribes and the Golden Triangle from Chiang Rai. Your full-day adventure makes stops at Mae Chan, where you’ll visit the Yao and Akha hill tribe villages on your way from Chiang Rai. Traveling with a private guide insures all of your needs and desires are met, since the flexible excursion can be tailored to your interests. This exclusive experience allows you to enjoy a buffet lunch of traditional and western cuisine and pay a visit to the northern tip of the country where you’ll see the Thai-Burma border and wander the bustling public market. Spend one week taking in the top attractions in Vietnam and Cambodia on a private tour that begins in Hanoi and ends in Siem Reap. Go sightseeing in Hanoi and Ho Chi Minh City (Saigon), take a full-day cruise on Halong Bay and another on the Mekong Delta, and visit the Cu Chi tunnels. Conclude by flying (own expense) to Siem Reap to spend a day viewing Angkor Wat and other nearby temples. Your tour includes hotel accommodation with breakfast, local guides, and transportation by private car. Visit the Mekong Delta on an 8-hour tour from Ho Chi Minh City, and spend the day exploring Delta canals by riverboat, motorized rickshaw, kayak, and traditional rowboat. Along the way you’ll meet local artisans, sample regional cuisine, and learn about life on the Mekong Delta. This full-day Mekong Delta tour includes all activities, lunch in a local home, and round-trip transport from your centrally-located hotel in Ho Chi Minh City. Get an inside glimpse into Vietnamese culture on a 2-day tour of the Mekong Delta. Rather than rushing to pack everything into just one day, you'll visit Cai Be floating market, Can Tho, and the produce-rich islands of the delta at a leisurely pace. Plus, you'll spend the night in a homestay to observe local life and customs. 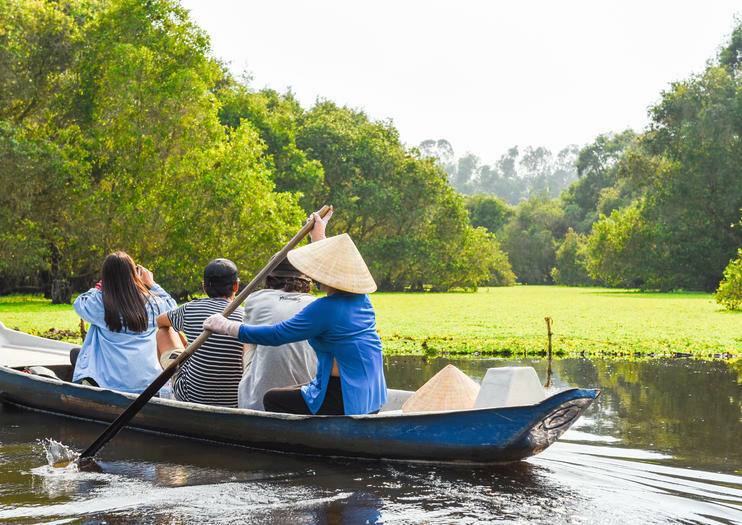 Escape the hustle and bustle of Vietnam’s cities on a 2-day tour of the Mekong Delta, an ideal choice for first-time visitors looking to relax and learn about local culture. Exploring with a guide means you’ll skip the hassle of navigation and have more time to enjoy scenic views on the way to the village of Lai Ving, the mandarin fields of Dong Thap, and Long Xuyen Floating Market. All meals, overnight accommodation, and hotel pickup and drop-off are included. See the sights of Vientiane on this 8-hour city tour that provides an introduction to Laos' capital and largest city. With a guide, you'll visit temples, monuments, and Buddha Park, plus see some local handicrafts. Lunch and hotel pickup and drop-off are included. Explore the Mekong Delta by speedboat on a small group tour that takes you into the rural villages along the river’s tributaries. A flexible itinerary means your guide takes you to where the action is that day: perhaps a whiskey or wine tasting, or a stop by a local’s house who keeps pythons as pets. Along the way you’ll see, hear, and taste the local culture as your guide shares information about the area. GUARANTEE: 1.NO TOURISTIC AREA,2.NO SHOPPING3. MONEY REFUNDThere are no better way to see Mekong countryside by bikes.A great chance to experience a daily life of the locals.Staying overnight with the locals would be a great experience to get close to their life.Reaching to villages where bus tours miss outVisiting to local market..Taking local ferries crossing canal/river.Stopping to chat with the locals.Learning some local Mekong Foods.and much more is waiting for your discovering. Escape the city for a scenic cruise along the Nam Ou River on this full-day private tour from Luang Prabang. Along the way, explore inside the sacred Pak Ou Cave, sample traditional Lao rice whisky in Ban Xang Hai village and marvel at age-old handicrafts like silk weaving and wood paper making in Ban Xang Khong village. Experience everyday life in laid-back Laos on this leisurely full-day tour from Luang Prabang. Hop on a ferry across the Mekong River, then set out along dirt trails, passing sleepy villages and patchwork farmlands. Pedal your way to a traditional Khmu village, where you can immerse yourself in country life as you help in the fields or prepare lunch with your host family. After lunch at the family home, continue to the pottery village of Ban Chan village, then glide along the banks of the Mekong to Wat Long Khun. The Mekong Delta is the ‘rice bowl of Vietnam’ and cruising past the riverside villages, orchards, and rice paddies is an unforgettable experience. This private 4-hour tour from Can Tho is ideal for those short on time, including a tour of the Cai Rang Floating Market, a visit to a traditional rice noodle factory, and fruit tasting at a local orchard. Immersing into seasonal picturesque flat rice fields and learn about daily activities on the Cai Be floating market. Taste the local specialties, visit interesting family businesses, such coconut candy and crispy rice popcorn mills; deeply explore the local village through handlebars; paddling the canal system by kayak; explore the local floating market at its nicest time and most exciting of the day. Enjoy the scenic journey along the Express Trung Luong Highway and take a leisurely boat trip around the four beautiful islands known as Dragon, Unicorn, Phoenix and Tortoise islands. Visit the picturesque orchards and sample the freshly picked fruit at the invitation of friendly local farmers. Get on a rowing boat ride in the shadows of the water-coconut palms along the tiny canals of Ben Tre Province and experience the traditional rural lifestyle of the Mekong Delta inhabitants. Immerse yourself in Vietnamese culture on this overnight tour to Can Tho from Ho Chi Minh City. Along the way, stop in Ben Tre for a boat ride and a short bike tour before arriving in Can Tho where you’ll spend in the night at a local home. The next day, visit the Cai Rang floating market and explore the village before heading back to Ho Chi Minh City. The Mekong Delta Eyes Cruises combines regional boat-building traditions with modern comforts to become the perfect holiday vessel to cruise the Mekong Delta in style. At 39 m long and 8.5 m wide, the Mekong Eyes river cruiser was built out of an old, traditional rice barge with the finest quality wood, and artfully decorated by skilled craftsmen of the Mekong Delta. Essential Mekong Delta – 2 days: Immerse yourself in the natural beauty and the rich culture of Mekong Delta region and spend time to explore the local floating market at its nicest time and most exciting of the day. Discover the quiet pace of life in the Mekong Delta on a 2-day tour that includes a homestay with a local family. Head to My Tho from Ho Chi Minh City, then board your boat to see the Mekong Delta from the Tiền River. Visit villages along the waterways, learn about local traditions, and watch the sunset. Includes accommodations, three meals, transportation, and a guide who facilitates the experience. The Bassac Mekong Delta Cruises is entirely built of wood, from the hull of an 80-foot-long rice barge. She can accommodate up to 12 passengers in six nicely decorated cabins, each with air-con and a private bathroom, and features a 100 sqft restaurant that opens all around, a large gallery, a small office room and 700 sqft of sundeck. Cai Rang floating market, one of the famous floating markets of the Southwest, specializes in selling fruits and agricultural products of the whole region. Every early morning, hundred boats gather together where their owners start to sell agri - products.